Acupuncture Weight Loss: Fact or Fiction? posted by Shaun Yeu on Friday 16 December 2005. I had the opportunity to interview acupuncturist Caroline Chen of Acupuncture For Life. Below is our conversation about Chinese acupuncture. For thousands of years, acupuncture has been used to treat diseases, facilitate healing and restore healthful vigor. Originating in China, acupuncture is part of a Taoist system of medicine that approaches each individual as an interconnected sum of physical, emotional, and spiritual qualities, constantly flowing, changing and affecting each other. 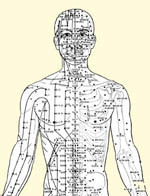 There are 365 acupuncture points on the human body. They are connected through channels of energy and goes through the nervous points of the body. These channels of energy is also known as "Qi" (pronounced chi). "To achieve optimum health, Qi needs to flow smoothly," says Caroline. "When an illness or injury occurs, there is a blockage in the channel and a Qi imbalance occurs." Acupuncture helps by unblocking the channels and allow it to flow smoothly again. Wear loose clothing, but not too loose. When going in to Acupuncture For Life for example, Caroline will do a pre-diagnoses to see what kind of treatment is required. Do not worry about the needles. They are in sealed packages and sterile. The needling will not hurt. If you can withstand a mosquito bite, you can withstand acupuncture. The needles will stay in 10-20 minutes. During that time you might feel a bit of heaviness, tingling, or something inside moving around (which is your Qi). However, most people feel relaxed. Certain treatments may require ear acupressure as well. It is said that the ear is a blueprint of the entire body from head to toe, inside and out. Each pressure point on the ear represent an organ or a part of the body. The most important thing to remember is that acupuncture will not fix ailments overnight. At least 5 treatments are necessary to have any sort of effect. It is a slow, gradual process. Fact or Fiction: In acupuncture, there is such a thing as a "death spot". Caroline says "it is possible for a master of Qi Quong to reverse the flow of Qi which will lead to death". Caroline graduated from UT Austin with a Bachelors Degree in Biochemistry. She thought about going to medical school but decided her passion was acupuncture. There are only about 30 acupuncture schools around the U.S. She attended South Baylo University in Anaheim, CA and graduated in 3 years from a 4 year program. Part of the curriculum requires 1 1/2 years of hands-on internship training. After graduating and receiving a Master of Science in Acupuncture and Oriental Science degree, she took 2 acupuncture license exam, one for California (because she did not know if that is where she would practice) and the National exam (mandatory for everyone). She passed both and is now a Licensed Acupuncturist (L.Ac). 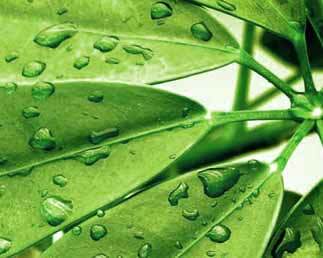 Her practice, Acupuncture for Life, is located in Houston, Texas. She went to China for 2 years after graduating acupuncture school. She taught English for a year and then through teaching there, she had the opportunity to work at a hospital in Tianjin, China. "China had the perfect integrated Eastern and Western hospital," she said. In the hospitals in China, she encountered many cases of how acupuncture helped people regain their lives. One story she recounted involved a lady who was comatose and was stabilized by western medicine. After doing acupuncture treatments for 2 months, she woke up , became a positive person, walked, talked, and was able to eat by herself. After her 2 year stint in China, she came back to Houston and opened up her practice Acupuncture for Life located in the Accucare Wellness Center. She has been practicing for 1 year and 3 months. In the U.S., Caroline has done a lot of volunteer work. She is part a stroke support group where she offers her service to anyone who wants to be treated with acupuncture. Q: Does insurance cover acupuncture? A: Some insurance do. Call your insurance company and ask. A: The needling will feel like an insect bite. Copyright � 2005 ChinatownConnection.com. Chinatown Houston Web Portal. 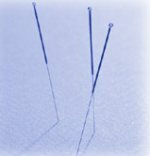 Acupuncture Articles. All rights reserved.